This storm day was striking in that it unfolded as a four-act drama–each one quite distinctive, essentially a quartet of distinct chases in one day. Seldom have I experienced so much logistical and emotional ups-and-downs in such a small area in one trip! We went from intense frustration to elation and satisfaction, with one or two minor dollops of danger thrown into the storm-intercept recipe for good measure. Elke and I targeted southeastern Wyoming for the potential of a supercell or two forming in a region of decent upslope lift . As we headed W from Pine Bluffs WY toward CYS, a storm formed in the Laramie Range and stem-wound itself into an intense supercell while still in high, rugged terrain. It turns out that storm formed as a pyro-convective plume off the Cow Camp wildfire, and became tornadic while still sucking smoke up in the mountains. We arrived in CYS intending to head N on I-25 and intercept that supercell, or whatever was left of it, somewhere not far N of Chugwater. 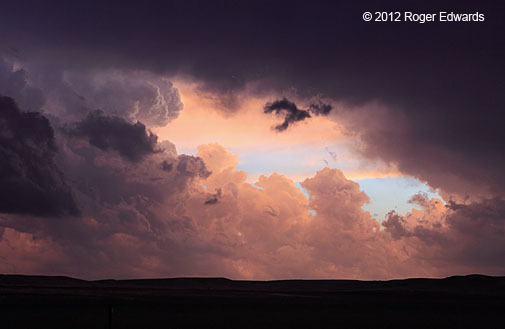 Then a new storm exploded into the Wyoming sky just to our NE. A bit of indecision followed, before we made the fateful choice to take a look at the younger cell. The storm farther away looked better on radar, but the new one was right there! How do you blow off a storm blowing up practically in your lap? We should have. 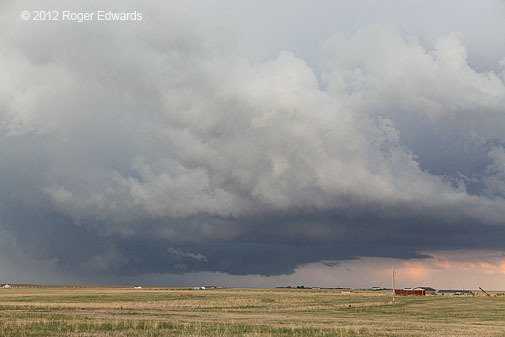 This move ultimately cost us any shot at a decent view of the Wheatland/Chugwater tornado(es). 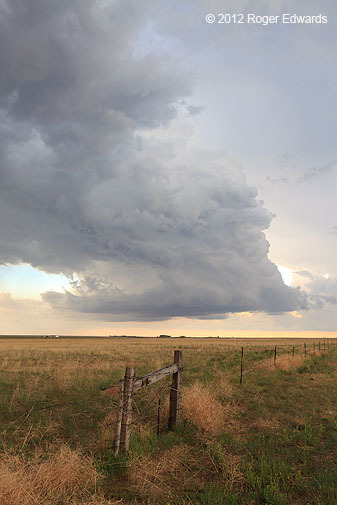 We headed the short distance back E toward Burns and then N, finding that the newer storm was shriveling, while the fire-generated, tornadic supercell to the NW still was going (and still had a likely tornado, given its radar signature). I was not happy. Still, zooming up US-83 toward the west turn to Chugwater, we thought we were in great position to intercept the big supercell while still tornadic. Indeed, given the official timeline for the event and our terrain-truncated vantages, Elke and I are now sure we caught some glimpses of a cylindrical, mostly rain-wrapped tornado just over the high ridge line in the distant WNW, while driving. I turned the vehicle W on WY-314, seemingly in ideal position to catch the end of the tornadic stage, and then about 8 miles along…a one-lane road, pilot-car closure with no pilot car! This was about when it seemed that our chase day just wasn’t meant to be. One lone lady in an orange vest was standing there with a flag, stopping all westbound traffic–most unfortunately, in about the lowest bottomlands where neither she or we could see diddly-squat. 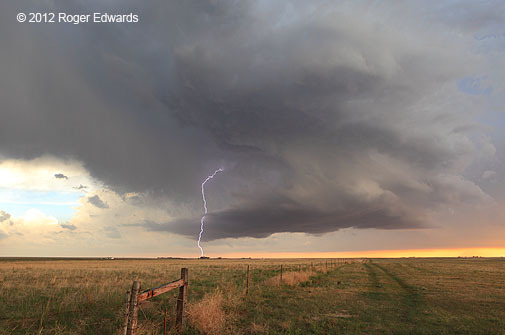 Diddly-squat, in this case, consisted of a tornadic supercell and its approaching forward flank. We told her about the storm, its likelihood of lightning, skull-cracking hail and flash flooding…but she seemed oblivious, and totally dependent on a radio dispatcher who was (quite irresponsibly) giving her no information at all about the storm. She finally assured me she would crawl into a nearby tinhorn if it “got bad”–which wasn’t much assurance with regards to her safety. Other than that culvert, there was nothing out there in which to take shelter! Alas, that was the best I could do to convince her she was in potential danger. Thus thwarted, we turned around and headed E and uphill several miles, finally getting a view of the storm’s base less then 7 minutes after the tornado is on record as dissipating. [Without the closure, we easily would have gotten on the plateau E of Chugwater in plenty of time to see the last moments of the tornado, across a flat and unobstructed landscape.] The supercell appeared to be getting more disorganized, with newer development to the SW…so we headed back E to US-83 then SSW toward CYS. That turned out to be the first good maneuver we made all day! 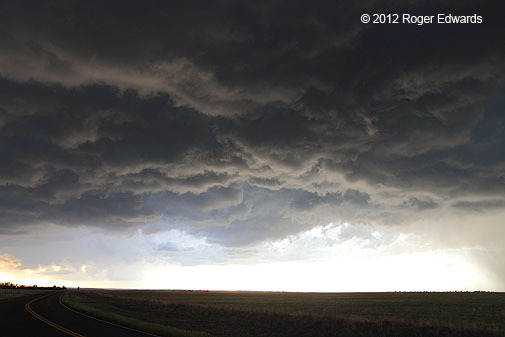 As we approached the newer storm, more and more chase vehicles appeared beside and on the road–the only decent road around for miles and miles. 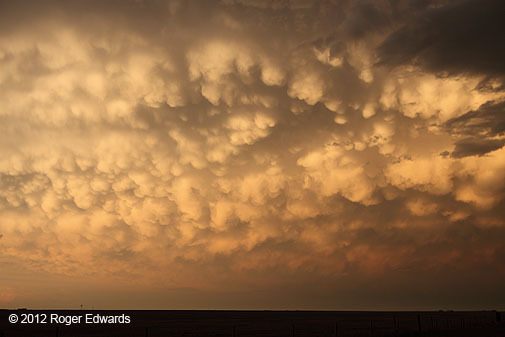 It was easy to see why–the storm erupted SE of the first one, right along the way for a lot of observers from Colorado and elsewhere who were zooming up toward the Wheatland storm when it fell apart. By contrast, we came around it from the NE and E, found a vantage to let it move toward us, and marveled at how the structure was getting better and better as it drew closer and closer. The main updraft base sported a persistent, broad wall cloud with occasionally fast rising motion on the downshear (core-facing) side, but never anything I would call rapid or tornado-like rotation. Meanwhile, the storm-scale formation assumed a sweeping, curvaceous stack across several layers in the vertical. With a dearth of road options in the general direction of storm motion (SE), we kept letting it come our way until the wide-angle lens needed switching from 24 mm to 17 mm. 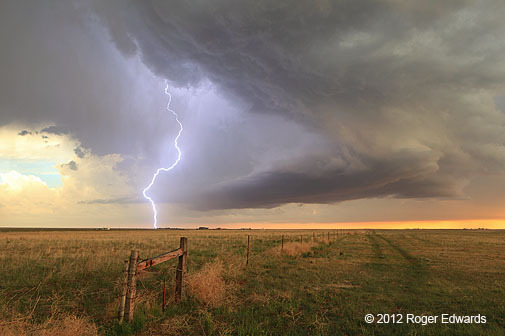 At one point, I recall telling Elke that I wished I could teleport Al Moller here–he would go absolutely euphoric over seeing this storm in person! The old wall cloud and mesocyclone area began to assume a more shelf-like appearance as they passed our location, and the entire storm looked a little more disorganized. The only roads back ahead of the supercell led through the core; so we had to retreat away from it in order to reposition. We went SW down US-85 and I-25, around CYS, then back E again, then S of I-80 between Burns and Carpenter, for an encore look at the increasingly messy storm. Another supercell also had developed to its east, its updraft base cloaked by precip for the time being; it was menacing Pine Bluffs. We pulled onto a side road to observe the onrushing maelstrom, greeted by a big, very friendly and rambunctious chocolate Lab, muddy-legged but healthy and well-fed. He probably belonged to a farmstead about half a mile away. The pooch took a running, leaping jaunt through my vehicle and out the other side before we shut the doors! If you ever are traveling with me and happen upon dog-paw prints, that is the reason. He hung around nearby for a spell until the storm spooked him back toward home. 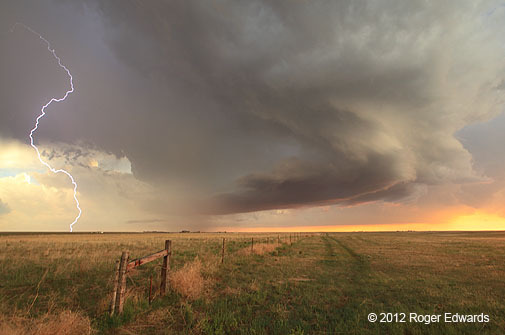 Since we had left it NE of CYS, the western supercell had become more elongated, with a somewhat surfboard-shaped base. Since it was riding its own outflow, this was appropriate! As that storm approached us from the northwest, the Pine Bluffs supercell weakened, shed some precip, and became higher-based. It also trailed a beautiful rear-flank arc cloud that curved right back into the updraft region of our storm (wide-angle view looking E). Dropping S somewhat to get late-day light under the rear-flank gust front region, we had a decision to make: stay apace and just ahead of the increasingly messy storm and its neighbors southward into Colorado, thereby missing an opportunity for sunset light on the back (NW) side, or go for the colorful view. We usually choose the latter in such situations, and did here, with ease. What wasn’t easy was deciding how. The updraft and main core area each appeared to be weakening some, so one way was to head straight N through the precip and back to I-80. The other was to go W on an unfamiliar road zigzagging along the crest of the Cheyenne Ridge, and hope for a good view before reaching Cheyenne itself. We chose to attempt the former, and if the hail started getting big, backtrack and do the latter. Just a mile or so into the precip core, we hit a very sudden wall of severe hail that started beating the hell out of the vehicle, somehow sparing the windshield. Spiked bombs of ice bounced high off the road, splashed in surrounding mud, and created sickening booms as they slammed into the metal skin above. So much for the “weakening” core! Eager to escape the ice monster, we bolted 12 miles W and NW on the road from Carpenter to Cheyenne, the stopped at a very nice 360-degree vantage for one last look back SE at what had tried to turn my finely tuned storm-intercept machine into Swiss cheese. 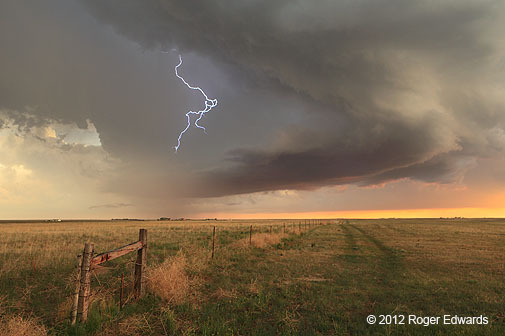 The hail core is at left in the last shot. Yes, it was still a supercell…so what, and good riddance! It was almost time for sunset magic. But wait…what happened to the sunlight that had been behind the storm we just got behind? All manner of cloud material had developed and masked much of the sky to the NW and W, and a small, left-moving storm was moving from my SW toward the NNE…dragging its precip core toward us. Furthermore, it was rather stinking cold up there on the High Plains ridge–low-50s temps and windy from the supercell’s torrent of outflow! Just as I despaired over this seeming state of misfortune, two glorious happenings made our day. A mammatus field to our NE, its sunbathing not blocked by clouds, came aglow brilliantly for a few minutes, while casting reflected, bronze-toned front-light onto the landscape to our W.
Heading westward between Campstool and Altvan, through the edge of the left-mover’s translucent core and toward CYS, we encountered a second barrage of hail. Most mercifully were no bigger than dimes, but it was very hard and noisy. Leaving that barrage, our minds were firmly fixated on securing lodging and a hot meal, when a window of amazing color and light briefly opened in the southwestern sky, as if magically. The haunting vista seemed as if we were peering out from within a cave of darkness at an extraterrestrial world light-years removed. After getting a motel, we found a Perkins near downtown CYS that still was open, and headed in for a supper that was late, but most welcomed, after a day of wildly fluctuating fortunes out on the road. As we did so, I saw lightning flashes outside, then flipped on the phone radar to see that a high-VIL core was almost upon is from yet another elevated left-mover. The resulting heavy pounding of small hail reverberated through the building, as a small flash flood washed down the low spots. Drifts of the stuff washed through the parking lot and against the wheels of my vehicle–all for our entertainment. Our third encounter with a hail core was the most fitting way to end the storm day! Everything we had seen since leaving the destructive supercell supported the ideal that long after the main supercellular action concludes, the storm-observing day can proceed with wondrous and spectacular results. For all the lackluster results of the previous day’s storms, this one made up in multiples. Moreover, as of July 28th (this post date), we saw more rain in half an hour in Cheyenne than in Norman during the nearly two months since.